GROUPE ROYALTY was founded by a team of experts in residential renovations. 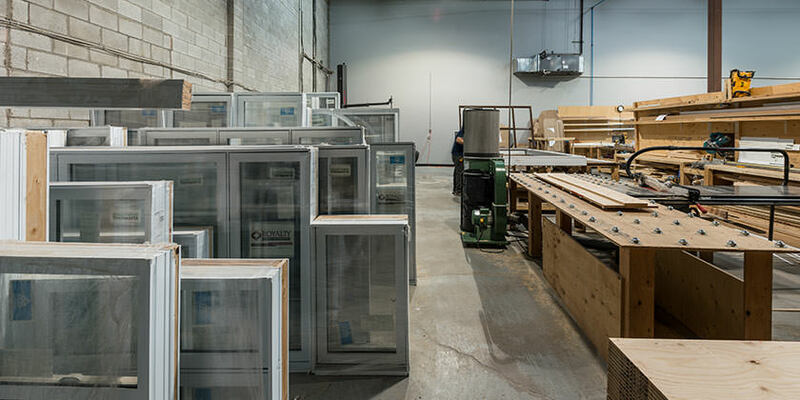 Over the years the company put its expertise into the manufacturing of doors and windows and offered its clients the expertise of their own installation teams. GROUPE ROYALTY has its own window manufacture located in Saint-Laurent next to their head office along with a showroom. It also offers two other showrooms, Vaudreuil-Dorion and Laval, a distribution warehouse in Montreal. It is through all these channels that GROUPE ROYALTY continues to offer its clients the best products, at the best price and the best service and is in continuous expansion. GROUPE ROYALTY’s contribution to residential renovation in Quebec is significant. In addition to being a manufacturer of quality custom doors and windows, it’s above all, a team of experienced managers that lead complex as well as smaller projects, and always with the same care. More than anything, GROUPE ROYALTY offers peace of mind that comes from a quality product, a wide selection, excellent service and a long-term warranty on its Energy Star certified products. A quality service, a quality product and a quality experience by quality people. Only energy-efficient doors and windows to create a healthy and safe environment for our clients. No worries, no doubts, no surprises. The creation of local jobs and an investment in youth and in people. Our clients are our greatest asset; we’re responsible, loyal and always available. Why Choose ENERGY STAR Certified Doors and Windows? Did you know that more than 25% of a home’s total heat loss comes from windows? The consequent increase in heating costs compels many to wonder if there’s a durable and economical solution that can cut down their electric bill as much as possible. One of the more interesting options is Energy Star. Energy Star is a voluntary environmental protection agency that determines the energy cost of doors and windows. For a product to be labeled “Energy Star certified”, it must pass several tests to see if it meets the strict specific technical criteria relative to energy efficiency. The Energy Star initiative is a voluntary partnership between the government of Canada and industry, with the joint goal of making energy-efficient products readily available and visible to Canadian consumers. Energy Star qualified products are 20 to 40% more efficient than traditional models. These products can save up to 10% on electricity costs. Since lower energy consumption means a decrease in greenhouse gas emissions, these products protect the environment. Energy Star products are tested and certified, which means they have been approved according to quality standards set by the government. They allow for less condensation in cold weather, and they filter ultraviolet rays for better protection against sun damage. In short, don’t forget that the purchase of doors and windows is an important decision, especially considering that we tend to change these approximately every 20 years! You can benefit, for one of these years, from the refundable RénoVert tax credit. This tax credit was put in place to recognize eco-friendly renovation projects on an eligible dwelling that you own or co-own. To make your life easier, GROUPE ROYALTY fills out the paperwork for you! With the arrival of the RénoVert program, you may receive up to $10,000 in tax credits! This refundable credit is 20% for expenses greater than $2,500. Practically speaking, for work valued at $7,500 ($5,000 admissible) that’s been carried out by a recognized contractor, the tax credit will be $1,000. To earn the current limit of $10,000, the owner will have to carry out eligible work valued at $52,500 between now and March 31, 2019. Door and window installations are among the projects eligible for the credit, confirming the importance of making eco-friendly choices when it comes to residential renovations. Among your options is the notable energy-efficient glass, which is not only friendly for the environment but also for your wallet! With all our windows being ENERGY STAR qualified, we’re confident to provide you quality doors and windows that will also be eligible for the RénoVert program. Want to install new doors and windows and benefit from this program? Contact us to plan your project with us! We’ll do all the paperwork! The work must be carried out on a primary residence or a winterized cottage. The residence must be located in Quebec and must have been built before January 1, 2016. The individual must be the owner (or co-owner) at the time that the expenses are incurred. An intergenerational home is eligible, as it is considered a primary residence for several people. Any structure adjoining or serving as an accessory to the dwelling, with the exception of a garage, is not eligible. For example, a garage is acceptable, provided it shares a wall with the dwelling or its roof is connected to the dwelling. Supporting documents (quotes, invoices) must be kept for verification purposes at tax time. GROUP ROYALTY, windows and doors manufacturer, was founded by a group of experts in residential renovation and adepts of doors and windows production.